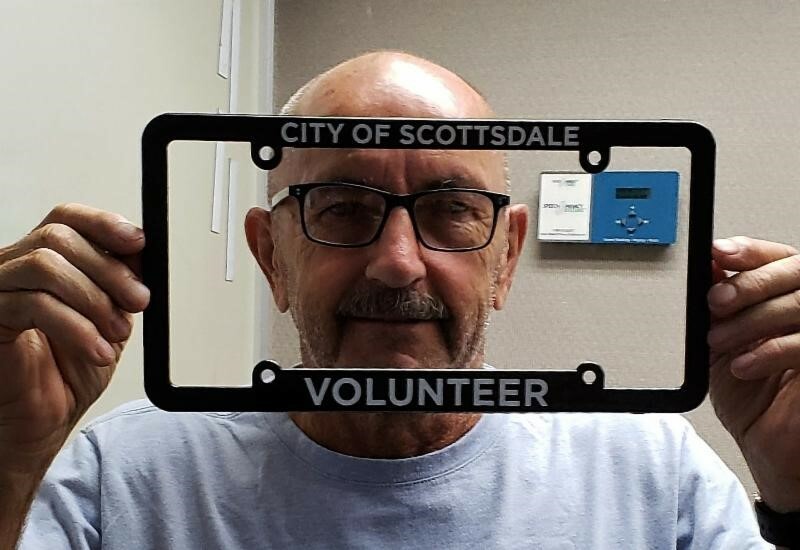 Scottsdale citizens deserve special recognition as a community of caring individuals who give their time generously to a variety of worthy causes. In fact, as citizens give voice to their individual passions through volunteerism, their collective passions often define the priorities of our community. Last year, more than 5,000 volunteers contributed over 160,000 hours to help make our city services more robust and less expensive. The dollar value of their contributed hours amounts to more than $4 million! This, of course, is in addition to dozens of citizens who volunteer to serve on Council-created boards, commissions and task forces. Almost 700 volunteers help with various Human Services programs. Many are involved at Granite Reef and Via Linda senior centers. Others lend a helping hand at Vista del Camino and Paiute Neighborhood Center in food bank, back-to-school and holiday programs. Teenagers and adult volunteers – more than 600! – worked in our libraries on the summer reading, children’s early literacy programs and as Friends of the Library. Downtown Ambassadors help visitors find their way and enjoy all that our downtown has to offer. A team of almost 200 volunteers participate in Neighborhood Watch, making our neighborhoods a little safer. A small group of three, Bob, Eleanor and Janet, cheerfully sort our City’s history in the basement of the Scottsdale Historical Society. More than 1,300 individuals volunteer their time in the Adopt-a-Road program, picking up discarded litter to make our City shine – for residents and tourists alike. Close to 800 individuals volunteered their time in the City sponsored “Operation Fix-it,” a program that lends tools and labor to residents in need. Ron Roth (pictured on the right) was an early volunteer in the Adopt-a-Road program, then went on to work in Operation Fit-it. When he “retired” earlier this year, he was immediately “recruited” to participate in a new volunteer program engaging citizens in discussion about issues important to the city. The only “pay” Ron expects is a license plate frame recognizing his volunteer work. Beyond direct contributions of time to city departments, many organizations who partner with the city also rely heavily on citizen volunteers. The McDowell Sonoran Conservancy boasts an army of 600 volunteer Stewards who help provide public access to the McDowell Sonoran Preserve, protect the Preserve through research and stewardship and increase the community’s understanding and appreciation of the Preserve through educational programs and community events. 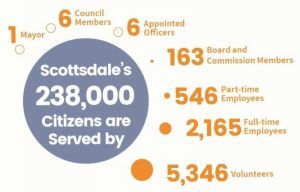 Scottsdale Arts could never manage the city’s arts programs without the involvement of over 1,000 caring individuals. Their volunteer time extends to the Center for the Performing Arts, the Scottsdale Museum of Contemporary Arts and the Public Art programs. During spring training baseball season, the stadium depends on countless hours of volunteerism by members of the Scottsdale Charros organization and Honor Health’s hospital auxiliary. Beyond these city and city-related programs, our schools and non-profit organizations throughout the city make our community a better place to live … always relying on the generosity of volunteer hours: Scottsdale Boys & Girls Club, YMCA, STARS, Honor Health and MAYO all depend heavily on community volunteers. Individuals who volunteer in our community are the ambassadors who give our city a reputation for caring. To our citizen volunteers: I applaud your enthusiasm and thank you for your good work! The collective efforts of your helping hands and smiles make our city more livable, our city government more efficient and, very importantly, our taxes low. Thank you! What Would Herb Have Said? Paid for by the Committee to Re-elect David N. Smith to Council: Approved by David N. Smith.